A miniature hyena! That was Erica McLain’s first impression of the brindle-colored Chihuahua mix whose big ears were poking out of a fuzzy yellow blanket in her Petfinder photo. 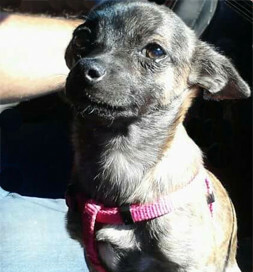 HOPE Animal Shelter in Tucson had listed the dog, Bella, along with her brother and sister and their mother, a Terrier mix. Erica scrolled through other photos of the dogs. “She was the only brindle in the litter,” Erica says. “In fact, she’s the only brindle Chihuahua I’ve ever seen.” She made arrangements to meet this little cutie. “When I went into the kennel, Bella got up, came straight to me and set her tiny body next to my leg and decided I was hers,” Erica says. “Her (bigger) brother came to check me out, but Bella wasn’t having any of that.” She let him know Erica was off-limits; Bella had made her decision. And so had Erica. Though Bella only weighed four pounds, she quickly let the bigger dogs in her new home (a large black Labrador Retriever and a medium-sized Australian Shepherd) know she was the boss. “They are elderly, laid-back dogs and took right to her,” Erica says. “They just lie there and allow her to literally and figuratively walk all over them.” Though it sounds as if Bella might be something of a diva, Erica says the little dog is actually quite easy-going. One of her favorite activities is riding with the McLains on their motorcycle, ensconced in a special carrier that is strapped securely to the luggage rack on the trunk. There’s even room for her water dish. “We’re in the process of getting her to wear [her dog motorcycle goggles] to protect her big, beautiful eyes,” Erica says. When Matt McLain comes home from work, Bella sings to greet him, and Erica joins in. “She generally gets the other two dogs wound up as well,” Erica says, “so we end up being a quartet.” Now that’s a homecoming! Coming to live with the McLains has been a homecoming for Bella and is something to sing about as well.